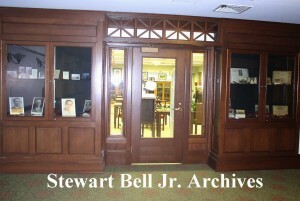 The Stewart Bell Jr. Archives, located in the basement of the Handley Regional Library Headquarters, houses an extensive collection of materials on the people, places, and events of lower Shenandoah Valley from 1732 to present. Highlights of the collection include family genealogies, rare maps, books, manuscripts and more. Hours of Operation: Monday and Tuesday: 1 p.m.-5 p.m.; Wednesday: 1 p.m.-8 p.m.; Thursday: 10 a.m.-1 p.m.; Friday and Saturday: 10 a.m.-5 p.m.